After the the peaceful revolution in 1989 East-Germans were welcomed to the open market with some reception money to buy western products and left with abandoned producing capacities on their own. In the years after the wall came down these old factory halls and open spaces always called the attention of many dreamers. Some wanted to build more shopping malls others found space for their arts or relaxation. Mostly those interests collided in some way or another, as in the times before 1989 when soldiers from East- and West Germany were looking closely at each other, conserving the status quo of “nobody is leaving” (east) and “everyone is welcome” (west). Even now, more than 20 years later the struggle for those spaces hasn´t ended yet. One of the most popular these days is the one at Cuvrystrasse / Schlesische Strasse in Berlin Kreuzberg. An oasis of green with 30.000 sqm directly at the Spree river and close to Oberbaumbrücke. 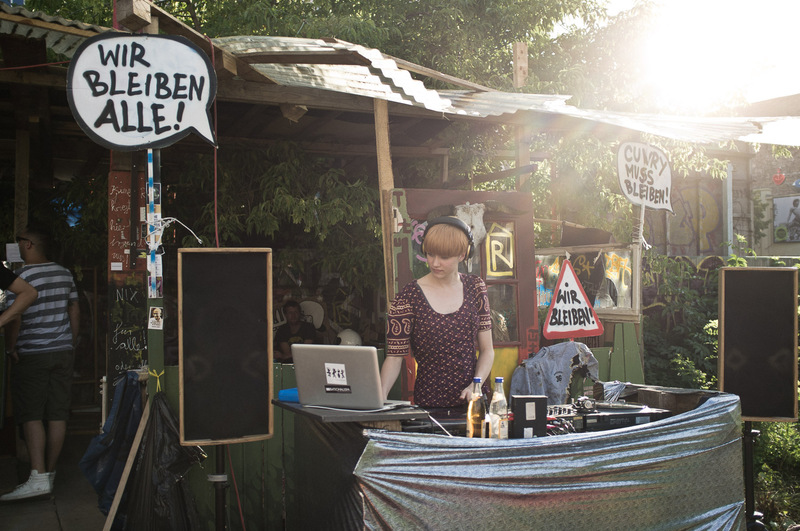 Now many of the neighbors and New-Berliners are using the space as a retreat and refreshing area, relaxing by the riverside, reading, playing badminton or just dancing at one of the spontaneous pop-up parties. It was shortly before that the officials of Berlin together with BMW wanted to build the Guggenheim Lab in this open space, in order to enhance the dialogue about the future of the town. The answer of the many citizens was, that they preferred to have the space as it was and some of the left-winged Berliners even that they would answer any attempts to clear the space in Cuvrystrasse with force. A few weeks later a legal letter was received by the people who now enjoyed the summer even in their tents on the open space. The letter was claiming that by the 24th of August the space would be expected to be cleared by those occupying it. As it seemed yesterday the locals had the reason to setup a DJ- lineup that would last the whole night and invited neighbors and by-passers to join their completely uncommercial celebration of freedom. The party lasted long that night and was shortly used to hold an asamblea about the issue and future options for the Cuvry Place. Many of the people enjoying the space joined an open discussion round and spoke about their ideas and suggestions on how to answer and react the announced clearing. The consensus was that everyone would find his own message, words and means but that a peaceful answer would be suited best. One of the most convincing arguments was, that this space is unused since more than 20 years, it saw the Yaam coming and going, plans for shopping malls and the BMW Guggenheim Lab but always it was so people who came back and used the Cuvry for what it was suited best: an open place for the people themselves, free to use for whatever they like. note to politicians & investors: Isn´t that the creative spirit that Berlin is / should be so proud of and inviting even more, or are we already saturated. note to people at Cuvry: I have only selected those photos, where no face can be recognized, except for the DJane. note to people not at Cuvry: Have a look at the place, you will probably enjoy the atmosphere.